In October of 2013, I was invited to be an assistant to New York Times and USA Today Bestselling Author Shelley Shepard Gray. At that time, I was a full-time stay-at-home mom to two young daughters in elementary school. I was familiar with Shelley’s writing because my mom would read her books and then pass them along to me. You see, my mom had taught Shelley’s daughter Lesley when Lesley was in fifth grade, and my mom and Shelley had kept in contact over the years. When Shelley was searching for an assistant, she reached out to my mom to ask if any of her retired friends might be interested. After hearing about the skills required for the role, my mom told Shelley she had described me. The opportunity was presented, and I was curious. I met Shelley for lunch, and the rest is history. Select and manage Shelley’s street team the Buggy Bunch. This street team is a group of readers who read, review, and promote her books online and in their communities. I package and mail paperback copies of each book to team members, and we connect and share through email and a Facebook group. Help increase Shelley’s exposure online through social media: Facebook, Pinterest, and Twitter. Design and order promotional items for Shelley’s street team and readers. Attend book signings: take pictures to post online, help set up/tear down, and sell books. Accompany her on research trips when the schedule allows. We’ve become good friends, and we have fun together on the road. Work with Shelley to plan reader events like the Reader Appreciation Tea in 2014, and the Cocktails and Cupcakes celebration in 2015, the Girlfriend Getaway 2015 in Pinecraft, the Amish snowbird community near Sarasota, Florida, and the Girlfriend Getaway 2016 with Vannetta Chapman and guest authors Mary Ellis, Amanda Flower, and Kathleen Fuller in Charm, Ohio. And I’m excited to announce we’re planning another event for next summer! When I made writing a priority in my life last year, Shelley encouraged me to enter my writing in contests, to attend a writers conference, and to pitch my book to agents. Though I set out to write inspirational fiction for middle grade readers, she nudged me to follow an agent’s advice and give Amish fiction a try. Now, just 14 months later, I have an agent who has shared two of my manuscripts with editors. Shelley continues to offer words of wisdom that have provided a great deal of comfort while I wait for feedback on my writing. I am blessed and fortunate to have crossed paths with Shelley. As I look back on this journey, I can see how God has woven our stories together. Through her, I have met so many amazing authors, industry professionals, and readers. It’s been rewarding to see how her writing affects the lives of others. I was humbled and honored when I discovered she dedicated her most recent release to me. 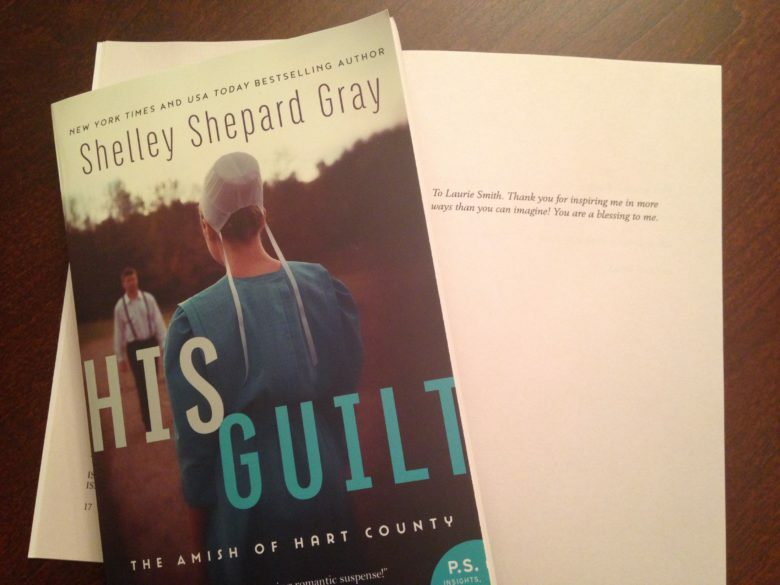 You can find copies of His Guilt, the third of six books in The Amish of Hart County Series, available for purchase July 4th.